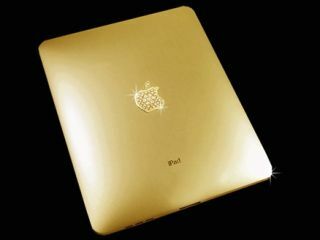 British-bought iPads are the costliest in the known world... particularly if they are covered in gold! iPads cost more in Europe and the UK than elsewhere in the world, according to latest reports. Prices in Britain and Europe are around around a quarter higher than in the United States, says a new study. Australia's CommSec iPad Index notes that there are savings to be made by Europeans traveling to Asia, the US or to Australia. Craig James, Chief Economist at the CommSec share trading division of Australia's Commonwealth Bank said that: "In the UK, Germany, France and Italy an iPad costs 20-25 per cent more than in the U.S.
"The question is whether Apple has priced its product too high for the European market, or whether the UK pound and euro need to depreciate further to bring global pricing into line." Prices for the cheapest, WiFi-only 16GB iPad range from $499 in the US to the equivalent of $620 in Britain. The top-end 64GB 3G iPad will set you back $829 in the United States, yet the equivalent of $1,010 in Blighty. "The CommSec iPad and CommSec iPod indexes suggest the U.S. dollar needs to lift against major currencies, but more so against the Euro and pound sterling," James added.